This is the new website for SHERRY WHITFIELD and The Ancient Crystal Skull Known as Synergy. The old sites had over 180 pages and existed as a resource about spirituality for 23+ years - until very recently. My long time hosting company stopped supporting the software that I used to design the site and gave me no warning. One day, I just stopped being able to make any changes. Now I have until June to start over and get the old site redone using new tools. It's going to take me time, time that I don't really have at this moment. I'll do what I can as I can, and hopefully, you will bear with me! "Native legends speak of crystal skulls as an inheritance from ancient times. Said to “talk and sing” they are believed to carry messages for all mankind, including what may be discovered when we overcome our fear of death. The first layer of working with any crystal skull, including Synergy, is "to remember." This is the first layer - and this layer has many other layers within it. What you are to called to remember is who you really are. It's so easy to get caught up in the little daily things that take our time, attention and energy... and to forget that life is short and sweet, even with all of the pain and difficulties. Remember that the real you is a Being of Light. You are a Spiritual Being, inside of a physical body, at this time. Remember..."
Synergy is what this skull is called, but more precisely 'Synergy' is the quality of or the interactive energy that this skull is said to manifest or represent on the earth, at this time. Synergy is defined as the cooperative action of two or more independent entities, to bring about a total effect or change which is greater than what either can accomplish alone. In other words 1+1 = 3 or even more. What you and I together can accomplish is potentially so much more than what either of us could do by ourselves. Synergy is also called the "Skull of Joy and Laughter" or "The Laughing Skull." This nickname comes from some of the ancient runes that are carved on the bottom of the skull. Several times per year we do a laughing and gratitude ceremony with Synergy. Anyone who has experienced one will tell you that these energies are incredible and unique! This skull is a twin - and the twin is called Harmony by the tribal people who have it. They are an ancient people who have lived in the South Pacific for generations. Synergy is considered by many experts to be one of the best examples in the world of this type of artifact. It weighs in at 15.5 lbs and is the size of an adult human skull. 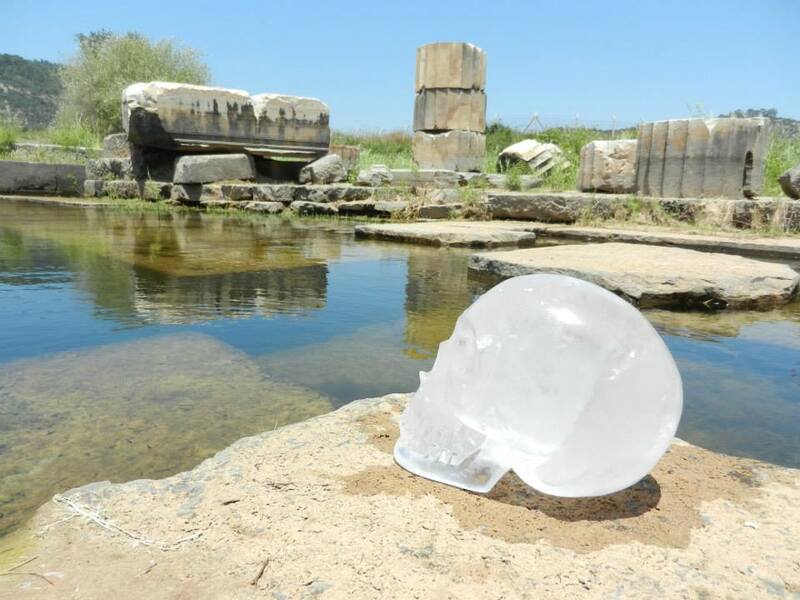 This crystal skull is included in several books and films about unexplained mysteries and crystal skulls, including "Ancient Aliens" the TV series. One of the many interesting things about this skull is that it was modeled from an actual skull. It is not an actual skull and it is not 100% precise to anatomical standards, as it is one piece, carved from a solid quartz crystal. However, it is close enough to what a real human skull looks like, according to two forensic anthropologists, that a face could be reconstructed on it. It is an intriguing thought. What would the face of Synergy look like? Why the shape of a skull? Among other things, the skull shape is thought to have been used by the Ancients to symbolize all of humanity - with every race and both sexes represented - a true symbol of equality. In death, as it should be in life, we are all equal in God's sight - and as hopefully we shall all be in each other's eyes, someday. "What do you use a crystal skull for, anyhow?" 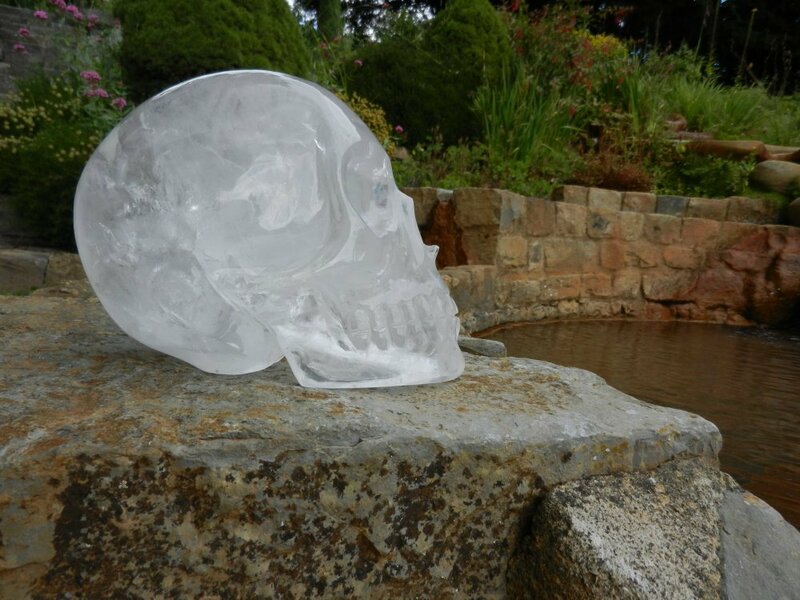 Crystal Skull researchers agree that crystal skulls have the potential to do certain things with energy, when carved properly. Crystal skulls are meant to be tools of spiritual awareness. Although these exact words might not be universally used by each person, the concepts are solid. If they can really do this, then Crystal Skulls are potentially very powerful tools of Spiritual Awareness. Crystal skulls amplify energy. That is something anyone working with a crystal skull will learns pretty quickly. So... what do they amplify when you are working with one? If you have no specific intent or thought of what you want when you are working with one, (or even when you are around one for very long) then they will tend to amplify the strongest underlying (and usually unresolved) emotional issue. This could be great if you are ready and willing to look at your own stuff. Or you could feel quite uncomfortable. You might feel emotional, overwhelmed... upset, anxious, peaceful, joyful, aggressive... any kind of emotion is possible. They don't make you feel anything, but they do amplify it. If you start working with a crystal skull then it's your responsibility to know that they could amplify and reflect your own stuff right back at you - and to be prepared. What could you set your intent on the crystal skull to help you in amplifying? I suggest setting your intent to have clarity, to start with. If you try to be more complicated, you may well trip yourself up. The subconscious is very literal and you have to know how to 'talk' to it to get it to cooperate. Even then, your own High Self may decide that facing your issues is a good thing for you to do, and that part of yourself is more interested in your long term spiritual growth and less about your comfort level. Clarity is a simple concept. It can help anyone, in a variety of situations, to have clarity. IF you have clarity, then you have a priceless tool for spiritual and emotional growth. Lots of people try to increase their psychic abilities. You probably already have some intuitive abilities, but odds are that you lack the clarity on how to use them to the best effect. How do you figure out what the heck something might mean, (like a dream) when it happens? Develop your Clarity! What would YOU do with a tool that could really do something like what I am describing? There is more about these concepts on other pages (either now or coming soon) and in Sherry's blog entries. A few centuries ago, in traditional, Western Christian religions, the concept of “Synergism” sought to reconcile two paradoxical truths: the absolute power of God to change a human being, versus the importance of humans taking responsibility for themselves and their actions. Synergisim emphasized how God and man can work together to accomplish great spiritual changes. It stresses the importance of using our conscious, free will to act in concrete, consistent ways, in accordance with spiritual principles which support the spiritual growth of ourselves and others. We decide to act. This allows our lives to flow more harmoniously, and with less conflict, as it is easier to receive inspiration and Guidance. Humans have the ability to apply their free will in order to align themselves with God’s Will -- and to choose to do the right thing. Not out of fear of a great and terrible God, but because it is their choice to do the right thing. Surrendering to a Higher power does not mean that a person’s Will is inactive; it is simply that we are resisting our own weaknesses. In other words, the Creator draws us towards It -- but It draws towards it only those who are willing. Spiritual emotion is not forced upon our Will as though we were statues. We accept it, and then, choose to act upon it. When moved by the Holy Spirit." It's truly horrifying to me how this movement of 'Synergism' was stamped out - almost entirely eradicated - because the idea of a human aligning him or herself with God's Will by choice was so terrible to the prevailing governments and churches. I find remnants of this kind of control in many areas of life today. I personally think that Religion should seek to enlighten humanity - rather than to enslave it to dogmas.